Metatarsalgia can be caused when feet are not able to work normally due to abnormal bone movement and incorrect alignment. This can be due to inherited problems, ageing (45+), weight increase, new or increased activity or weakness due to illness. Metatarsal bones are the long ones in our mid-foot which connect onto the toe bones. The main symptom of Metatarsalgia is usually a pain in the area behind your toes. 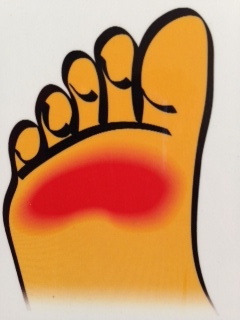 The sensations can be soreness, tenderness, swelling, tingling/numbness in toes or over the whole mid-foot, between bones, under the ‘ball of the foot’ and sometimes even on top of the ‘ball of the foot’ area. On occasion it can feel as if a stone is caught in your shoe. See pictures of Metarsalgia here - Careful - Some people may find these unpleasant! This is the next stage of Metatarsalgia. The abnormal bone movement has caused nerves and their sheaths to become trapped resulting in inflammation, numbness, heat, swelling. On occasion whole toes can be affected. See pictures of Neuroma here - Careful - Some people may find these unpleasant! The most effective treatment is to have the feet supported with Custom-made insoles/Orthotics. The Footbalance System is designed to create custom made insoles to aid alignment and a 30 minute appointment can leave you walking in greater comfort. Click here for more information on Footbalance. Other treatments include joint immobilisation, massage and acupuncture. These are offered by our colleagues at The Wyndham Centre. The most effective treatment is to be thoroughly and professionally diagnosed by a FeetcarePlus Professional using the Footbalance System. At FeetcarePlus we have successfully improved the comfort of many people suffering from Mortons Neuroma by creating custom made insoles to correctly re-align the foot structure. Footbalance can be used before or after surgery. We give advice and suggestions to ensure your feet are comfortable for the longest possible time. Call 01462 790065 or email info@feetcareplus.co.uk for a consultation.